Making tools that improve our lives is an impetus we can trace back into prehistory to times when we tamed the destructive force of fire and learned to fashion cutting blades from flint. Automation of activities can enable businesses to improve performance, by reducing errors and improving quality and speed, and in some cases achieving outcomes that go beyond human capabilities. Automation also contributes to productivity, as it has done historically. At a time of lackluster productivity growth, this would give a needed boost to economic growth and prosperity and help offset the impact of a declining share of the working-age population in many countries. Based on our scenario modeling, we estimate automation could raise productivity growth globally by 0.8 to 1.4 percent annually. Most work processes draw upon a multifaceted set of inputs: labor and capital; brains and brawn; creativity and rote repetition; technical mastery and intuitive judgment; perspiration and inspiration; adherence to rules and judicious application of discretion. To take advantage of the Fourth Industrial Revolution requires companies to redesign processes such that people collaborate with new technologies and hand-over operational control where automation can substitute for their labour. And inversely, within a redesigned process technology alerts human experts to retake control when their judgment and problem-solving skills are needed to complete a task. Process redesign involves mapping out constituent activities and the flow of control from activity to activity, and then analysing each activity to determine the appropriate level of automation, if any. Activities characterised by Professor Autor as involving rote repetition and adherence to rules are immediate candidates for automation, while abstract tasks that “require problem-solving capabilities, intuition, creativity, and persuasion” are best left to those in professional, technical, and managerial occupations. Intelligent Process Automation (IPA) is technology of the Fourth Industrial Revolution “designed to reduce the burden of repetitive, simple tasks on employees”. The robotic component of IPA is software programmed to automate rule-based and highly structured tasks. IPA can be viewed as a control function spanning multiple systems, that include databases and other information sources. IPA offers a clear interface, such that a process being automated appears as familiar and simple to operate by anyone already familiar with the work. This simplicity extends to IPA being explainable, so professionals responsible for the process immediately understand the current state of operation, and where and when the robot requires human assistance to complete a task. The impact of IPA is to improve productivity which is measured by comparing output per time unit achieved in the new process design with that achieved in the previous pattern of work. Highly valued by the corporate world, digital technologies are also exploited by sophisticated criminals who operate internationally to move and launder money. Guided by international bodies such as the Financial Action Task Force nations are enacting increasingly stringent regulations that guard their economies against financial crime. Assessing risk through due diligence in the form of KYC (Know Your Customer) and keeping records of these checks form the foundation of these defences. There is the possibility that financial regulation and requests for increasing amounts of data are hindering the capacity of traditional financial institutions to operate and more importantly innovate. Regulation and data requirements could benefit from being redesigned, simplified and automated. The UK’s MLR2017 legislation extends the requirement to undertake risk-based KYC to firms beyond the finance sector to those providing professional services, including the legal and accounting sectors. FinTech has the potential to be applied to regulation and compliance to make financial regulation and reporting more transparent, efficient and effective – creating new mechanisms for regulatory technology, ‘RegTech’. 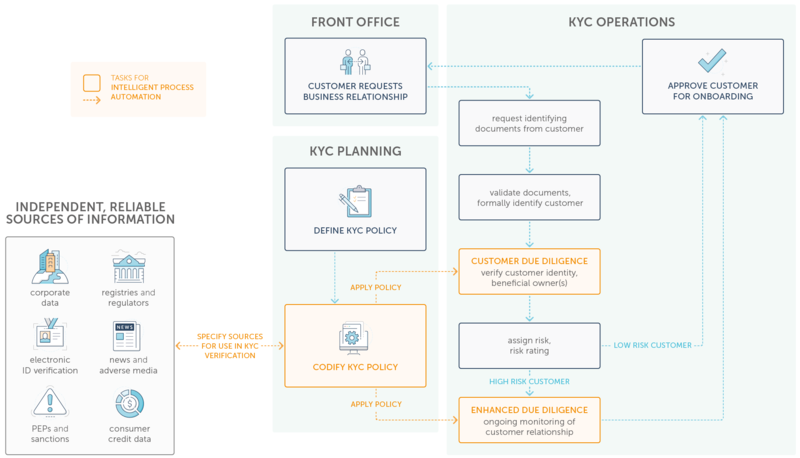 A high level schematic of activities constituting a KYC process is shown in Figure 1 and each activity is reviewed in the table below. Define KYC policy A KYC policy prescribes how a firm conducts KYC. Its definition includes the independent, reliable sources of information that the company will use in due diligence. 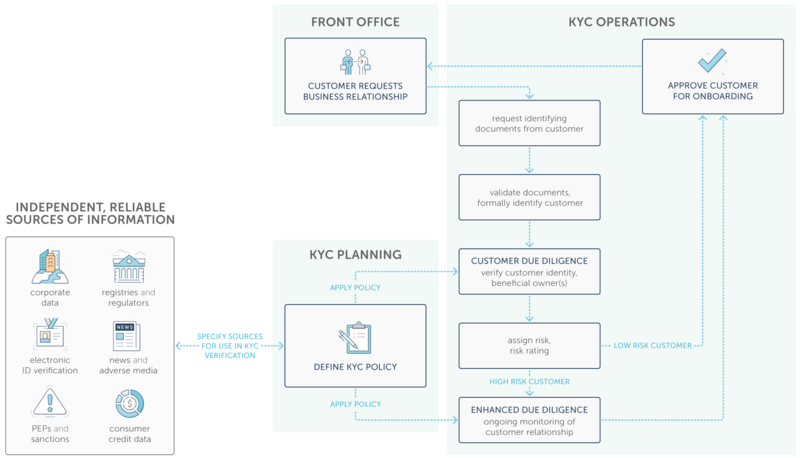 A KYC policy is defined once and then applied multiple times as each new customer is considered for onboarding. Low - requires expertise and judgment of a senior compliance professional. Request identifying documents from customer For corporate customers this includes requests for articles of association / incorporation. High - although many firms prefer face-to-face contact with prospective customers. Validate documents and formally identify customer Check the validity of documents and ensure they match the entity requesting a business relationship. High - involves validating electronic and physical security features of documents to establish proof of identity. Verify customer identity and beneficial owners Regulations such as the UK’s MLR2017 instruct firms to use independent, reliable sources of information to investigate corporate structure, directors., shareholders and beneficials owner(s). High - sources are available as digital information and published via APIs (application programming interfaces). Assess risk and assign risk rating New customers are typically scored as Low or High risk. Medium - based on facts discovered in screening, risk ratings are automatically assigned. Regulated firms can be assigned a low rating while PEPs are considered his risk. EDD (enhanced due diligence) screening Customers assessed as high risk must be subject to ongoing monitoring. High - sources of information on PEPS (politically exposed persons), sanctions lists and incidents of adverse media are digitised and published via APIs. Approve client for onboarding Customers scored as Low risk, or those High risk but who satisfy EDD screening are approved for onboarding. Medium - penetrating customer due diligence creates sufficient knowledge of customers to allow automation. McKinsey Global Institute (MGI) research suggests that companies can automate at least 30 percent of the activities in about 60 percent of all occupations by using technologies available today. Automating business processes creates opportunities to optimise by assessing each activity’s potential for redesign based on current and emerging technologies. Figure 2 shows a redesigned and automated process. Robotic process automation is applied to activities shaded in grey. The process design remains recognisably familiar, a characteristic of successful implementations of RPA. Changes include a new activity of Codify KYC policy and automation which has radically changed the productivity of existing activities. In the old process, KYC policies exist as business rules captured in paper or electronic documents which guide the work of KYC operations. In practice, this approach creates risk to the firm as the senior risk professionals responsible for creating policies can only be certain their policies are consistently applied in KYC Operations through constant oversight, and such policing proves impossible to maintain, degrading to staff morale and expensive. The work of Customer Due Diligence requires a KYC analyst to download information from multiple sources, compare facts on companies, shareholders and beneficial owners gleaned from each source and build an understanding that is comprehensive, consistent and accurate. This can be difficult, as each new information source requires the analysts to reassess and re-document their understanding. In the new process, IPA automates this work by extracting information in real time from multiple sources via APIs, and then analyses and merges multiple instances of the same legal entity (people and companies) represented in different data sources. Automation of this activity alone lifts the productivity of KYC analysts as due diligence work that previously consumed many hours is completed in just minutes by a software robot. Professor of Economics, David Autor observes “tasks that cannot be substituted by automation are generally complemented by it” and “productivity improvements in one set of tasks almost necessarily increase the economic value of the remaining tasks”. These effects can be seen in where automation of the activity of of Customer Due Diligence greatly simplifies the following activity when a KYC professional uses experience and judgment to assess risk and assign a risk score. Automated Customer Due Diligence creates an interactive chart that presents a consolidated view of a company, its subsidiaries, its parents, all directors and ultimate beneficial owners; this chart serves as an invaluable aid to all downstream activities within the process and other work requiring an understanding of a customer. For customers assessed as high risk, firms must apply enhanced customer due diligence measures and enhanced ongoing monitoring. Driven by a codified policy definition this activity is automated to improve productivity in KYC and the updated interactive chart produced facilitates the following task of approving a customer for onboarding. Evolving criminal threats continue to drive new, increasingly stringent regulations. Firms operating in regulated industries are obliged to update promptly the KYC profiles of all existing customers in line with new requirements. Until this remediation is complete firms are exposed to regulatory risk as their records reflect outdated or incomplete information, however experience shows that the time and effort absorbed by large-scale manual projects can bring compliance operations to a grinding halt. For a time, and in a bid to simplify the remediation challenge, rather than spend the time and money needed for penetrating KYC across their customer book, financial institutions chose to de-risk entire industry sectors considered of high-risk by wholesale termination of relationships. Regulators sought to curtail this trend, which had a particularly severe impact on the FinTech sector where it threatened to stifle the innovation so promising to banks looking to improve processes and drive efficiency. The daunting task of remediation is simplified and its costs dramatically reduced when IPA is applied to KYC processes as hundreds or thousands of existing customers can be checked against the requirements of the new regulation as a single task. The fourth industrial revolution has created the conditions for automation of much of the work of KYC. Intelligent process automation reduces costs and improves productivity of activities involving rote repetition and adherence to rules while freeing human experts to apply their experience and judgment to accelerate customer onboarding while protecting firms against the risk of being used by criminals intent on money laundering. Wayne co-founded encompass in Sydney and took the product to the Australian market in 2012. Since then, as CEO he has led the international expansion of the company, including the UK launch in 2015 and recognition as one of the UK’s most influential RegTech firms. 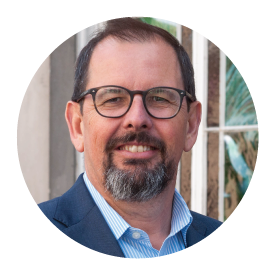 Prior to encompass Wayne was co-founder and CEO of Software Associates, until the company’s successful exit to a Hong Kong listed Company. Connect with Wayne on LinkedIn.